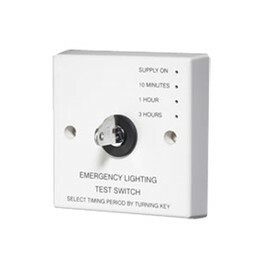 This automatic emergency lighting test switch is designed to test the function of emergency luminaires. The test switch is permanently wired to the emergency luminaire supply. A key switch is used to interrupt the supply to the luminaires for a pre-programmed period of time. At the end of the time period the supply to the luminaires is automatically re-instated. The result is that there is no risk of depleting the batteries in the emergency fitting. The unit will power up with the SUPPLY ON lamp illuminated the supply will be connected to the output. Flush fixing 25mm steel wall box or 32mm deep cavity wall box.